A new group campaigning to change the law on assisted dying is due to launch in Brent on Tuesday 25 September 2018. The group is encouraging local people to come along and get behind their campaign to allow terminally ill people the right to die on their own terms. They meet for the first time on Willesden Green Library at 7pm and anyone is welcome to attend. Brent is the latest group newest to join a network of 40 across the country which supports Dignity in Dying in campaigning for a change in the law to allow terminally ill, mentally competent adults the option of an assisted death. 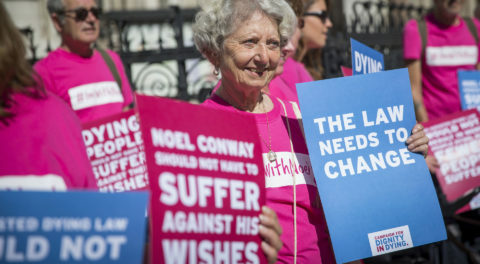 Dignity in Dying has been supporting Noel Conway, a 68-year-old man from Shropshire who is living with terminal motor neurone disease, to challenge the current law on assisted dying. He fears that without a change in the law he may be forced to suffer against his wishes, and hopes his case will be heard at the Supreme Court in the coming months. “We believe that terminally ill people in Brent and beyond should be able to die on their own terms, peacefully, at a time and place of their choosing – but right now, they can’t. People are taking drastic measures at home and abroad because the law denies them true choice and control over their death. For information on the national campaign, please visit www.dignityindying.org.uk or contact Ellie Ball, Media and Campaigns Officer at Dignity in Dying at ellie.ball@dignityindying.org.uk or 0207 479 7732.